Accommodation in the private sector or the possession of a country house, of course, have a lot of advantages. To list them all for a long time, and do not need. We shall touch only one of them - the possibilities equipped with swimming pool. Just imagine: summer, scorching heat, you no longer have to hide in the conditioned space in anticipation of twilight, when the heat a little retreat. No need to go to the nearest body of water in search of coolness. You put on a bathing suit and into the water. About how much happiness is uncomplicated hydraulic structure will give the children not even worth talking about. 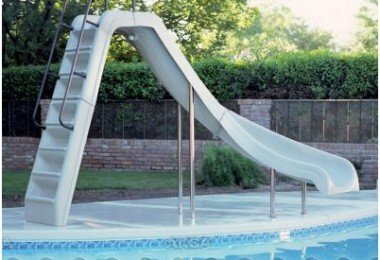 Only by giving the pool at the disposal of little tomboy, remember Pool stairs must be safe, and the water level - less than the waist of a young child. 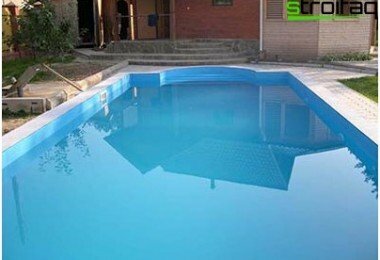 How to choose the right pool? In fact, everything is quite simple - choice of pool depends on your financial capabilities and the plot area. Most of the costs would require the construction ofstationary concrete basin. Such a structure is not enough just to build, it must be constantly maintained. As a rule, it is engaged in by representatives of specialized firms. Few would be cheaper pool tab of composite materials, but a permanent service to spend still have. The average price segment presented collapsible frame pools. These are products of metal pipes and plastic laminate. It's quite expensive pleasure - inflatable pool. It is easy to transport and do not need to maintain. Despite its apparent simplicity, the choice of the appropriate ladder for the pool - it is important. From the correctness of this choice depends on your comfort, and sometimes health. Especially this is true for fixed recessed basins of reinforced concrete or composite materials. Stair treads must be covered with anti-slip coating. Stairs should be well lit. 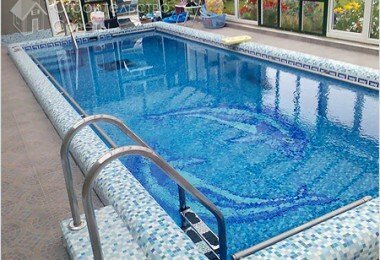 If the pool will be used by children, is an extra children's ladder. In such products the distance between the stages is much less. Another option arrangement descent in poolis the so-called "Roman" staircase. It can be made in one piece with the bottom of the pool, that is, to lay in the construction. Then the stage will be as lined and insulated. As a rule, in the riser insert underwaterlanterns for lighting, and sometimes even jets for hydromassage. This allows you to sit on the steps (or lie down, if the pool is large) and enjoy beating jets. There are only two options. Or attach a steel ladder stainless steel, or buy ready-made "Roman" ladder - they are made from high-strength polymers. The sale comes a ladder of different shapes, colors and sizes. 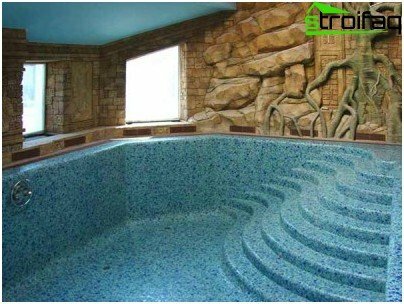 Designed for rectangular, round and oval pools with depths ranging from 50 to 150 cm. If your pool is irregularly shaped, it is possible to order additional interface elements. If you chose the wireframepool, no you can not do stairs. In this case, its absence makes bathing not simply less convenient, and often impossible. Frame pools are not buried, so to get over his side needed a ladder. Such structures do not differ particularly diverse. They have the shape of letter "A" or "P". Recently equipped with a special attachment for fixing the pool. Pool ladder frame in the form of the letter "A" do not differ in shape from the normal ladder. They are also equipped with steps and upper platform. To differences include the presence of the hinges at the bottom of the legs, which provides a special ladder resistance, and does not allow to fix it. 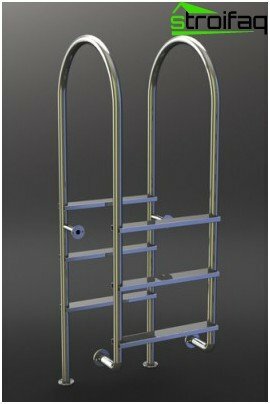 Racks of such ladders should be made of stainless steel and the upper area and stage - from durable plastic with anti-slip coating. Ladders for inflatable pools are made by thesame way. When buying them it is important to take into account the depth of the basin and its thickness of the flanges. Be sure to note whether equipped with a ladder rack with special caps to protect the bottom of the pool from the break. Turn an ordinary swimming pool in a water entertainment center at home will allow all sorts of slides for swimming pools and other accessories. Manufacturers offer a huge range ofsuch products for every taste and budget. 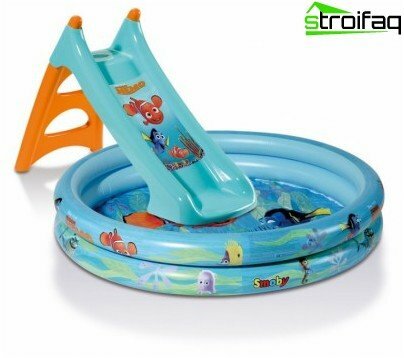 For small unburied frame or inflatable pools, unfortunately, will not do the jumps. But a huge selection of all sorts of slides and fountains more than compensates for this drawback. 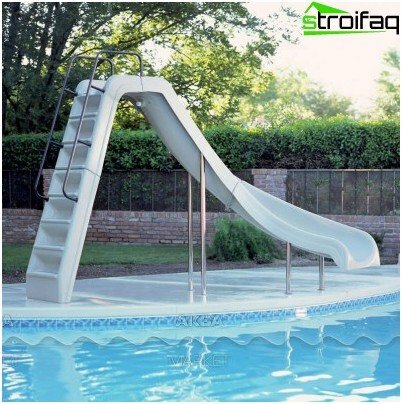 Slides for pools make it a favorite holiday destination of your children. Typically, the frame of this product is made of stainless steel and the steps and the trough of fiberglass. Due to the strength of the material, slide will last you for many years. Important! In winter, this hill is recommended to clean the room. To improve the slip can be arrangeda constant flow of water from a hill. It's enough to buy a small pump, which will pump water from the pool to the top of descent point. Sometimes, such a pump is sold complete with a slide, and if not, you can quite easily organize this process on their own. There are also inflatable slides, but they are moresuitable for recessed basins. But inflatables models with built-in slide perfectly suited for children's activities. They take up little space and does not pose a health risk, even the youngest children. As you can see, have a great water recreation zonesimply on the site. Today, in order to have a swimming pool is not necessary to be a very wealthy man. Of course, a large stationary pool - great fun for adults. But the children enough or inflatable frame pool for fun games and recreation. The main thing to see to it that the ladder inflatable pool, a plastic slide or inflatable trampoline were as safe.